Hey ! Great block at only $60k ! Looking for a Rental Appraisal ? Have Fun at Mission Beach ! Take a Day Trip ! Located at the end of a cul-de-sac and slightly elevated, this block overlooks an historic coconut grove which leads to the Cassowary Corridor. To protect and maintain the Cassowary Corridor, which forms part of the estate, a Body Corporate has been established, proudly managed by us. We also look after the common gardens and pathways, lighting and entrance ways. Low fees of approximately $700 per annum. Take advantage of the First Home Owner's Grant before it ends on 30 June 2017. Tania has always been professional, friendly and understanding of our needs. Great agent. Tropical Property was always in touch with us while we were selling our house and kept us up to date and informed managing the rental of our property as well ! Great communication, easy to deal with, nothing was too much hassle ! We felt Susie was down to earth and could ask any questions and get an honest response. Highly recommend. Tania was polite and always quick to respond to our queries. She showed my family around the area and provided valuable advice. I recommend Tania to everyone - She is very honest and keen to get the job done, thank you to you and your team. Easy to deal with, not pushy and efficient. I'm not the easiest buyer to deal with and Tania made it all so easy with her honesty and willingness to get the deal done. Would not hesitate to use her and Tropical again. Tania committed to quickly sell three properties I listed with her. In a difficult market, she achieved what others could not. If you are serious about selling, list with Tania. Always on the ball and kept in contact when needed. A good result! Very unexpected sale..all handled from beginning to end beautifully. Krystal at Tropical Holidays was amazing and worked very hard to achieve a better result for us. She responded to all of our communications and we can't thank her enough for her efforts. Tania was professional, courteous and understanding. Tania was very helpful and patient as we viewed quite a few properties. Tanya promoted our property and showed more clients than any other agents. Tania gave us some sound advice when negotiating a price with a seller. She responded to questions promptly and communicated with us, every step of the way, with friendly, competent professionalism. It is a pleasure to work with Tania. Her in-depth knowledge of the local market coupled with her professional approach made our recent purchase a straight forward, stress-free exercise. 2nd property bought through Tania, very smooth process again. Even with a bit of delaying on our part nothing seemed to be a problem. Highly recommend dealing with Tania and Tropical Properties. Thank you for being such a good real estate agency; I always enjoy my dealings with everyone who works there ! Hi Susie & Team, You guys are very easy to work with, friendly, conscientious, ethical and hold to a high standard. And I must get in and photograph The Shack one day ! Tania was wonderful; responsive and knowledgeable and above all, committed to delivering us the result that we needed. 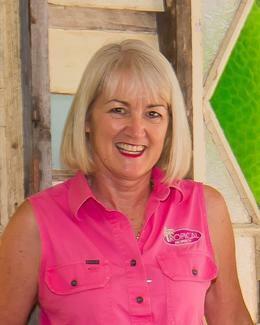 We absolutely recommend Tania and the team at Tropical Property. Wonderful people - and the best real estate I've been through ! The staff at Tropical Property are so lovely and honest. Have been dealing with the ladies for a few months now for my property - down to earth and personal ! Can't recommend this agency enough; professional, efficient and friendly! Look for the pink signs ! We have loved renting through Tropical Property; the friendliest people we know and would gladly do it again ! I like your style you Far North Queensland Belles! Love the pics, great write up. Thanks for caring enough and doing a good job at what you do. This would have to be one of the best Market Analysis that I have seen in MB!